Every so often a network attached storage device will come along that catches our eye that makes us do a double take. Many of the complaints that come from other NAS devices on the market are the failure rate of the hard drives that are inside of them. Failure rates aren’t really something you want to have to worry about when you’re talking about devices that are designed to protect your precious data. 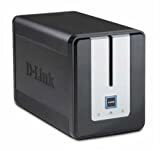 This D-Link device takes the frustration of hard drive failure away on the part of the company by allowing the end user to install their own hard drives to customize their own space requirements. By far the best feature of this device, apart from the rock solid brushed metal construction that keeps this thing sturdy like a rock, is the ability to add your own hard drives. The no-tools installation of the hard drives into the DNS323 couldn’t be easier. There are 2 separate 3.5” SATA drive bays within the device that can be accessed simply by flipping open the lid. You quite literally slide your hard drives into place, plug the device into your router and into the wall, and you’re up and running. The ability to install your own drives means that you can customize your storage needs and configure the device through RAID 0, RAID 1, or JBOD to doubly protect the data you back up over the network. 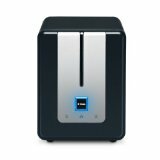 Compared to other NAS devices on the market that come with a hard drive, this device is a little more expensive. The device itself costs approximately $150 depending on where you look, but luckily you get a lot in return. The gigabit network card and processor within this device are more than capable of handling anything you throw at it and we easily obtained close to our expected 100megab it speed on our network when tested out. Unlike other devices that fall short on promises to transfer data quickly over the network, this device really lives up to their claims and we had no problem at all streaming and transferring large media collections to and from this thing. While we don’t have specifics on what drives do and don’t work, a lot of users seem to report issues with Western Digital drives in this device. The reason for the fault with Western Digital drives is their advanced formatting capabilities. The D-Link just simply isn’t capable of formatting the way a lot of Western Digital drives want to be formatted and the result is an incompatible drive. Luckily, there are many competing hard drive manufacturers on the market whose drives will work and you can snag those for the same price, or cheaper than the Western Digital. Overall, the D-Link DNS323 is a very solid product that performs just like expected out of the box. With powerful innards running the whole device, and even a built in bit-torrent client to download files directly to the server, the DNS323 is a very great choice for your home NAS needs.